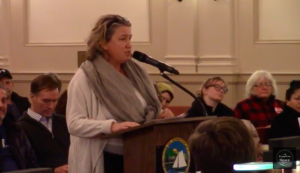 Last evening, the Kingston Common Council unanimously passed Resolution No. 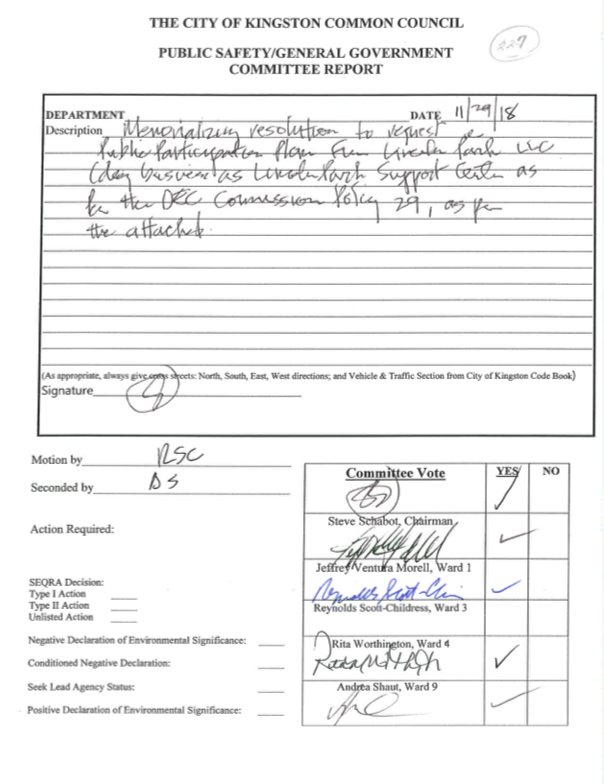 227 “Requesting an (Enhanced) Public Participation Plan for Lincoln Park LLC (also known as GlidePath and/or the Lincoln Park Grid Support Center) as per the Department of Environmental Conservation (DEC) Commissioner Policy (CP) 29.” This relates directly to a fossil fuel peak energy power plant being proposed in the Town of Ulster, where only 1.3 miles away (and downwind) is Kingston’s Rondout that includes an environmental justice area identified by the DEC.
What’s this all about and why is it significant? 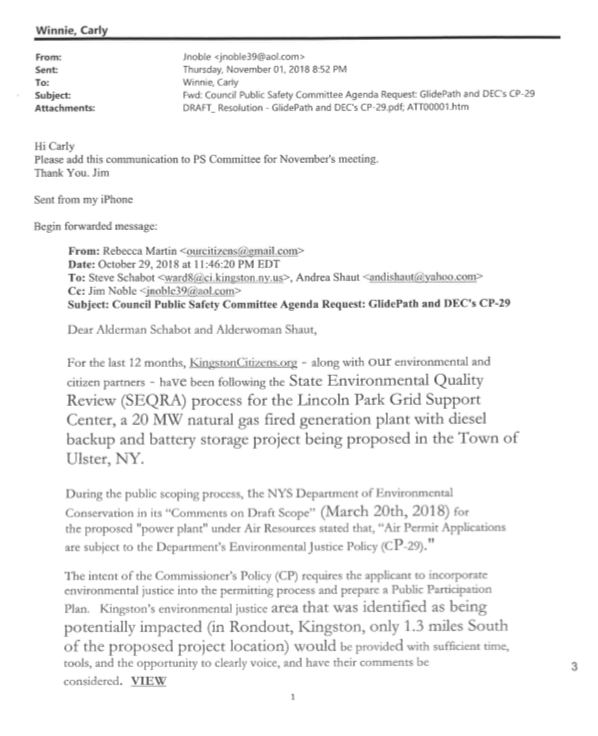 For the last 12 months, KingstonCitizens.org – along with our environmental and citizen partners – have been following the State Environmental Quality Review (SEQR) process for the Lincoln Park Grid Support Center, a 20 MW natural gas fired generation plant with diesel backup and battery storage project being proposed in the Town of Ulster, NY. VIEW “Toolkit and Video: Residents of Ulster County and “G” Zone Counties: Temporary Moratorium on Fossil Fuel Power Plants to Address Zoning. 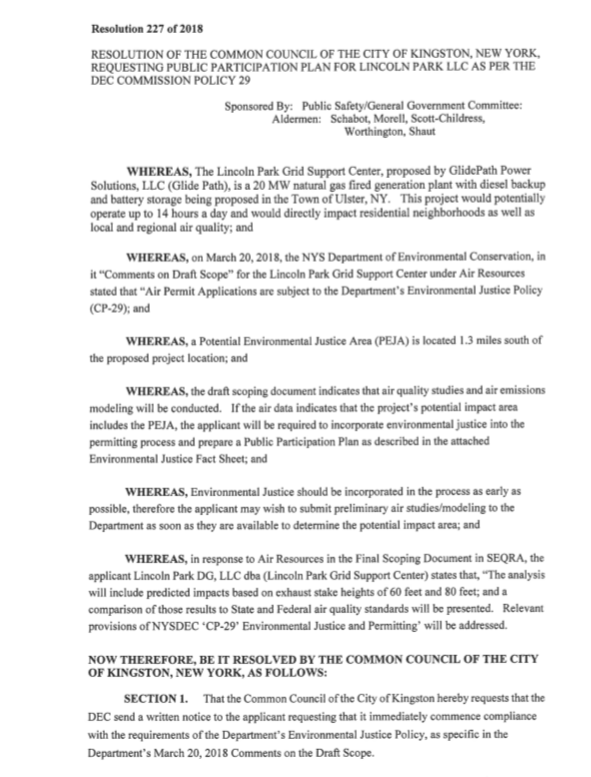 The intent of the Commissioner’s Policy (CP) requires the applicant to incorporate environmental justice into the permitting process and prepare a Public Participation Plan. 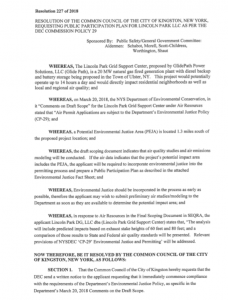 Kingston’s Environmental Justice area that was identified as being potentially impacted (in Rondout, Kingston, only 1.3 miles South of the proposed project location) would be provided with sufficient time, tools, and the opportunity to clearly voice, and have their comments be considered. Process Steps: Passing Resolution No. 227. 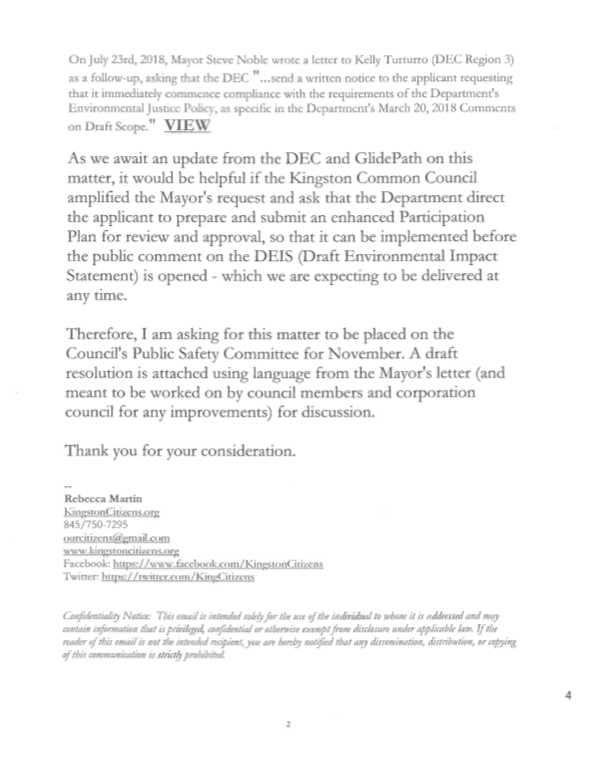 As we awaited an update from the DEC and GlidePath on this matter, on October 29, 2018 KingstonCitizens.org asked that the Kingston Common Council amplify the Mayor’s request and also ask that the DEC direct the applicant to prepare and submit an enhanced Participation Plan for review and approval, so that it can be implemented before the public comment on the DEIS (Draft Environmental Impact Statement) is opened – which we are expecting to be delivered at any time. The process steps included getting the item on the Public Safety Committee agenda for November for discussion. The resolution language was looked over by Kingston’s Corporation Council, and sent out of committee to caucus where it went to the floor to be voted on last night – and passed unanimously. It was a great night for this item to be on the agenda, too, as we also got to witness the Municipal ID program as well as the Mayor’s 2019 Municipal budget all pass unanimously. We’d like to thank our elected and appointed officials and staff alike for their thoughtful leadership and hard work. Click on image for individual testimony. Resolution #220 to approve the city’s general fund budget for the fiscal year 2019, as Amended.